To mark the thirty-fifth anniversary of New England’s only master of fine arts in dance, graduates of the program are returning to Smith this year to teach classes, create choreography, and perform. It’s a fitting way to celebrate a program that its graduates credit with deepening their artistry as dancers, choreographers, and teachers. An MFA dance concert featuring current MFA students will be presented February 10-12 at 8 p.m. in Theatre 14 in the Mendenhall Center for the Performing Arts at Smith. MFA students find creative inspiration for their own dancing and choreography, and as teaching fellows they, in turn, inspire Smith undergrads—thousands of them over the years, in popular technique classes, like hip-hop, jazz, and tribal fusion, that are often overenrolled. “It adds tremendously to the Smith community to have the MFA dance program here,” says dance department chair Susan Waltner, who helped launch the MFA in 1976. The tiny program—it accepts only four new students a year—has a disproportionate effect on the campus. 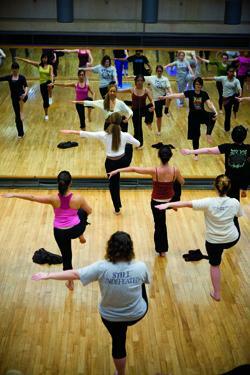 “About 425 undergrads per semester take a dance class. Having MFA students greatly increases the classes we can offer,” Waltner says. The MFA program’s anniversary also draws attention to how college-level dance has evolved. Before there was such a thing as a dance department at Smith, dancers performed their jetés and pirouettes as part of the physical education department and learned choreography as a theater class. Graduate students in dance got an MS in physical education. By extension, faculty members were hired not by other dancers but by, say, soccer and basketball coaches. “Dance is an art form, not a sport,” said Waltner of the arrangement. 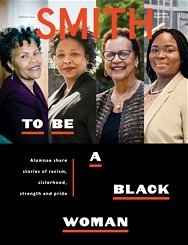 By the mid-1970s, dance was thriving at Smith, and when the physical education department reorganized, jeopardizing the graduate dance program, Waltner seized the opportunity for change. “A bunch of us in the Five College dance community said, ‘We have these thriving little departments, all as part of PE departments. Wouldn’t it be great to combine forces and create a stronger collective body to make decisions about dance programs?’” Waltner recalls. President Thomas Mendenhall supported a combined Five College dance department, which would also include a master of fine arts dance program to be based at Smith. Last month, Nordstrom and her classmate Virginia Scholl, MFA ’79, joined forces again at Smith to create a dance for a special MFA alumni concert in November. Indeed, MFA graduates are teaching at colleges, universities, and secondary schools around the world, including Hampshire, Williams, and Middlebury colleges, Boston Latin, and Wake Forest University. They’ve also used their talent to found dance companies, work as choreographers, and, of course, become performers in celebrated dance companies, such as Bebe Miller and Doug Elkins. Outside the United States, MFA dancers are living and working in Ireland, Portugal, the Middle East, Taiwan, the Dominican Republic, and other countries. The yearlong anniversary celebration will continue March 3–5, with choreography by Katie Martin, MFA ’10, for current MFA students as part of the Five College Dance Department Faculty Concert to be presented at Mount Holyoke College’s new dance theater.